Structured data can help you to send the right signals to search engines about your business and content. But where do you start? Columnist Tony Edward has some suggestions. You have probably heard that leveraging schema markup (or other kinds of structured data) can help increase search engines’ understanding of your site’s content, as well as enhance search visibility via rich snippets, featured snippets and Knowledge Graph results. Structured data is a great way to create more search engine-friendly signals, which can indirectly impact search rankings. Google’s John Mueller recently stated that the search engine giant may add structured data markup as a ranking factor. So it is definitely worth the effort to implement schema markup on your website, as this is becoming more important to Google. However, it can be confusing at times to determine which schemas you should use on your website. There are many, and determining which ones to use can be difficult. Below, I have listed a breakdown of which schemas might be used by specific website types. Some can be used across all sites. The following schema markup types can and should be used across all different site types. They are not specific to any vertical or industry. The organization schema markup helps generate brand signals which can enhance your Knowledge Graph entry and website snippet presence in the search engine results pages (SERPs). Be sure to specify your logo, social profile links and corporate contact information. The WebSite schema markup helps generate the Sitelinks Search Box feature for brand SERPs and can help your site name to appear in search results. You must, of course, have an existing site search on your website to enable the Sitelinks Search Box element. The BreadcrumbList schema allows you to mark up the breadcrumbs on your site to generate breadcrumb rich snippets for your pages in the SERPs. The SiteNavigationElement markup can help increase search engines’ understanding of your site structure and navigation and can be used to influence organic sitelinks. A site with embedded or hosted video content can leverage the VideoObject schema. Google primarily displays video rich snippets for YouTube videos, but this will help video rich snippets to appear for your Web pages in Google Video Search. Leverage the SoftwareApplication markup on your software apps to enable app rich snippets. Required Properties: The only required property is the “name,” but Google notes that rich snippets are currently only shown for apps that include at least two of the following properties: AggregateRating (including ratingValue and either ratingCount or reviewCount). AggregateRating (including ratingValue and either ratingCount or reviewCount). AggregateRating (including ratingValue and either ratingCount or reviewCount). Used together, the Product and Offer markups can help product information to appear in the SERPs, including price and status information. Note that the Offer markup is required in order for the price to appear in Google SERPs. The Rating schema is primarily used on e-commerce sites but can also be used for a local business site, such as a restaurant. When an item has multiple ratings that have been averaged together to produce an aggregate rating, you’ll want to use the AggregateRating schema. (Note: Google assumes that you use a five-point scale, with 1 being the worst and 5 being the best. If you use anything other than a 1–5 scale, you’ll need to indicate the highest possible rating with the “bestRating” property.) These markups will help generate star rating rich snippets in the SERPs. If you’re a publisher website, the NewsArticle or BlogPosting schemas are recommended (choose one or the other, depending on your site/content). Leveraging these markups accordingly can help your content to appear in Google News and in-depth articles search suggestions. You can leverage LocalBusiness and PostalAddress schema markup to impact your local listing. This markup can be implemented on sites with brick-and-mortar locations. The schemas can be used to indicate your physical address, opening hours, payment types accepted and more. Schema.org examples for location pages (on Google). The Event markup can be used for sites that organize events, musical concerts or art festivals to generate event rich snippets. Google Resource Page: Enabling Rich Snippets for Events. Note: You can also promote your events in Google’s Knowledge Graph; get more info here: Listing Your Events in the Knowledge Graph. Recipe websites can leverage Recipe schema markup to enable recipe rich snippets. 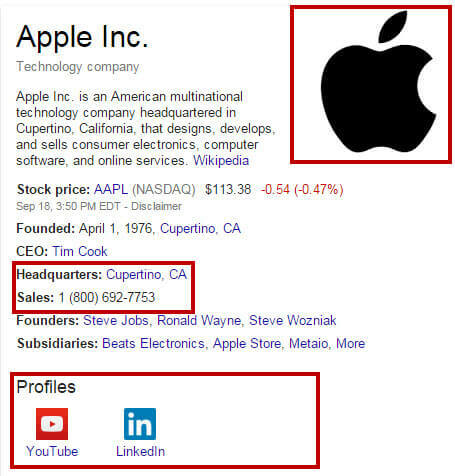 The Person markup can be leveraged to influence Knowledge Graph results about an individual. Be sure to use the following resources to monitor and test your Schema and Structured Data Markup. Structured Data Markup Report in Google Search Console. Note that your site can be hit with a penalty if you do not follow Google’s guidelines for Structured Data. Read more here.